A little while ago, I started working on making a new cap - my earlier one was the first I'd ever made, of course I did it without a real pattern, and the cotton was too heavy as well, so it was just terrible. Because I wanted to be able to sell caps in my store, I knew I couldn't start out with a commercial pattern (although I had been at the point where I was prepared to buy one for my own use, which, if you've been following me for a while, you might recognize as desperation!) and so I'd have to start over and figure it out properly. My first stop was at Garsault's L'Art de la lingère (1771), which I translated and then kind of forgot about doing anything with. The instructions aren't hugely helpful. 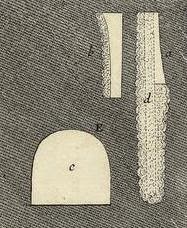 It says that double (probably thicker) muslin should be used for the crown, and clear muslin for the ruffles; the crown is whip-gathered to the brim, and the ruffles are whipped on as well. The drawstring confused me at first: "... at the bottom of the crown, in which one crosses the two linen tapes, the right going out to the left, and the left going out to the right." It seemed like it would be hard to tighten the cap enough. In previous attempts, I'd made an eyelet in the middle of the channel and ran the drawstrings out of it to tie the bow, and even that was always kind of loose. This actually works better! Score one for the primary sources! I would have liked to minutely inspect some online images of this sort of cap, but they especially do not survive, even though hundreds of caps from the early 19th century do. Life is unfair. 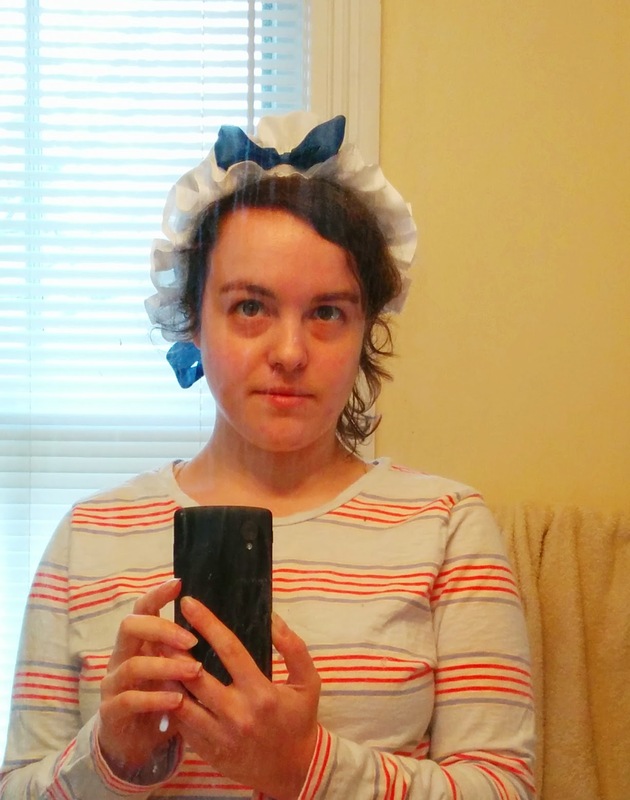 Garsault explained the construction well enough for me, and my cap (minus the ruffles, which I only just put on) was holding very well to my head, but I still needed to figure out the ribbon. I'm not quite sure now why it was so difficult for me, but in the end - to cut a really rambly story short - I realized that in a lot of portraits and fashion plates, especially ones with bouillonnée ribbons, it looks like the middle of the ribbon is tied into a single or double bow over the forehead, it's sewn down at each bubble, and then the ends tie at the back of the neck, providing another stabilizing element. My ribbon is of course from Dames à la Mode on Etsy. Caps aren't available through my Etsy shop yet; I want to get some good photos next weekend, and then I'll put it up. But very soon! Kitty, every time I got frustrated (I have a much smaller cap crown and brim hanging around here) and wondered what I was doing, I thought of you! 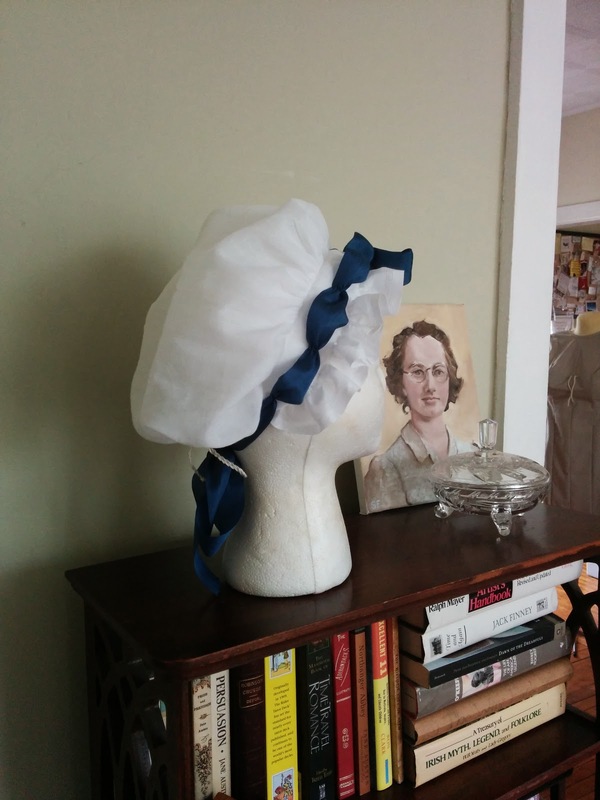 I'd like to make another with a pleated brim, just so I can feel solid with both techniques. Right?!? Nineteenth century caps are a dime a dozen (ok, maybe not quite that numerous...). Life *is* unfair! But this cap is lovely, right down to that gorgeous blue ribbon. Had to giggle: life is entirely unfair when it comes to extant articles. Your cap is a darling, and hooray-'ooray-'ooray for the closure! So, you run both ties through the same channel, but the left tie heading right and exiting at the right edge, and the left tie doing the opposite. Then do you pull both ends and tie them in the middle? Methinks yes?